Central Iowa is at risk to a wide-range of natural, manmade, and technological hazards. Some examples include tornadoes, floods, winter storms, dam failures, chemical releases, agricultural disease, and more. In response to these risks, the Warren County Iowa Emergency Management Commission (WCIA) in collaboration with JEO Consulting Group, Inc., is seeking to better understand how these hazardous events impact central Iowans in order to increase community resilience. 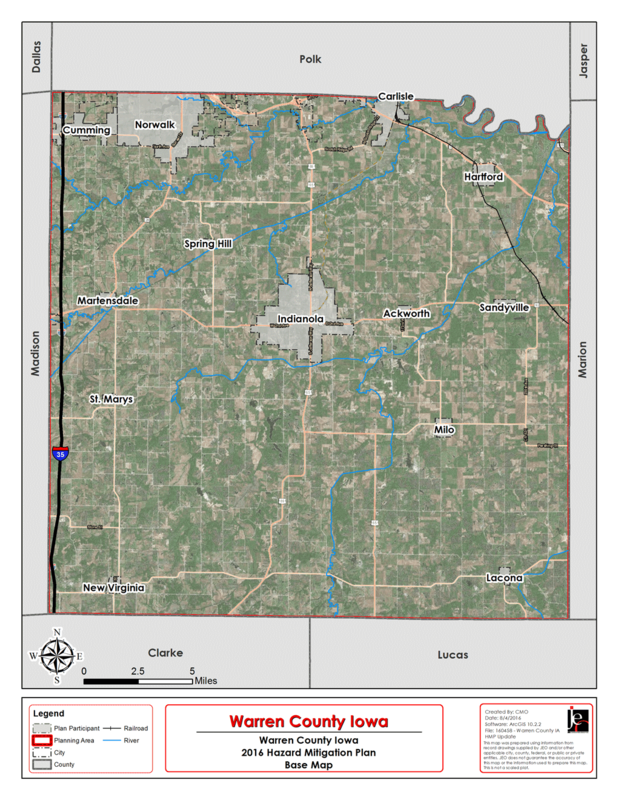 To that end, WCIA will be updating their multi-jurisdictional Hazard Mitigation Plan (HMP) over the next year, with the goal of reducing risk to hazards before they happen to communities in the WCIA. building partnerships within your community and across the WCIA. Residents, communities, schools, fire departments, hospitals, and more from Warren County are invited to participate in this process by attending meetings and providing information for the plan. To view and download the current 2011 Hazard Mitigation Plan, please contact Becky Appleford. A four-hour Hazard Mitigation Workshop was held at the beginning of the planning process for the Warren County HMP. The goal of the workshop was for attendees to gain a better understanding of the hazard mitigation planning process. It covered: an explanation of hazard mitigation, how the planning process will benefit the community, requirements for getting an approved HMP, and the types of information you’ll need to provide at the upcoming meetings. The first public meeting for the hazard mitigation plan update was held in Indianola. The goals of the meeting were to provide attendees with a brief overview of the planning process and to gather information needed to complete a draft of the plan. Information collected at the meeting included identifying hazards of greatest concern, identifying critical facilities, and updating the status of mitigation projects selected during the last hazard mitigation plan. The second public meeting for the hazard mitigation plan update was held in Indianola. The goals of the meeting were to: identify specific projects to reduce the impacts of hazards, review the updated draft participant section, review community plans for the plan integration review, and collect any other missing information. A Funding Workshop was held for all jurisdictions participating in the Warren County Hazard Mitigation Plan. The workshop provided information on the available grant opportunities for funding and implementing mitigation actions identified in the plan. Representatives from the USDA Rural Development, Iowa Finance Authority, and Iowa Homeland Security and Emergency Management Department gave presentations on grant funding during the workshop.